A designer of retail and residential interiors in Washington, DC, Jackie Chalkley is best known for her clean, understated and refined interiors, which treat space in a sculptural way and often incorporate artwork into key focal areas. Highly respected for her timeless aesthetic sensibilities and consistent attention to detail, she has years of expertise in successfully taking innovative projects from concept to completion. Chosen by Washingtonian Magazine for having “The Best Taste in Washington”, Chalkley has been the recipient of numerous design and merchandising awards. Before putting together a team of associates to work with her on interior design, Chalkley was the founder and president of a retail business that bore her name for twenty years in the nation's capital. 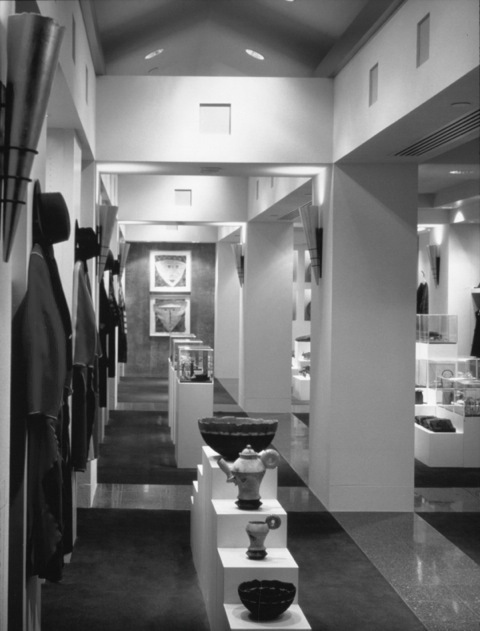 Using a gallery-like approach, her three stores featured well-designed contemporary clothing, accessories and decorative home furnishings, many of which were one-of-a-kind or produced in limited editions. The stores, which were designed in collaboration with acclaimed architects, were admired for their award-winning interiors and exceptional customer service. Chalkley's work with interior design grew out of a lifetime love of all things visual. After twenty years of providing Washington women with an individualistic approach to expressing themselves through fashion and accessories, Chalkley is now using those same skills to provide her clients with ways to express themselves through the spaces they inhabit. Long sought after for her "eye" and clear sense of comfortably innovative style, she has a passion for working closely with her clients to develop personalized surroundings that reflect their needs, their lifestyles and their budgets. Whether those budgets are large or small, she believes that good design is attainable at every price point. During recent years, she has also expanded the offerings of her firm to include project management for condominium associations planning the renovation of their public spaces. Since closing her stores, Chalkley has applied her signature style to textile development for projects in Mexico, the US and Saudi Arabia and has collaborated on hand-embroidered fabrics produced in India exclusively for such renowned designers as Jack Lenor Larsen and Thomas Pheasant. Additionally, she has juried art and design exhibitions for dozens of organizations including the Smithsonian Institution, American Craft Council, Renwick Museum, Corcoran School of the Arts, National Trust for Historic Preservation and the DC Commission on the Arts. Chalkley is an avid traveler, enjoys modern dance and is active in numerous museum and cultural organizations in Washington, DC. She holds a B.A. in Art History from Brown University and an M.A. from Columbia University in Fine Arts and Fine Arts Education. Jackie Chalkley store at the Willard Hotel named by the American Society of Interior Designers “Commercial Interior of the Year"
Jackie Chalkley featured in Home and Design magazine, Women’s Wear Daily, the Washington Post, Washingtonian Magazine and numerous other national and local publications. She has also appeared in TV interviews. Chalkley selected to jury art and design exhibitions for dozens of organizations including the Smithsonian Institution, American Craft Council, Renwick Museum, Corcoran School of Art and National Trust for Historic Preservation. Chalkley invited to participate on numerous Honorary Committees for fundraising events, including galas for the Textile Museum, Design Industry Foundation for AIDS (DIFFA), Washington Project for the Arts, Source Theater, Corcoran Museum, Arena Stage Living Theater, Rincones Dance Theater, Washington Charitable Fund and Aid to Artisans. Former member of the National Resource Board of the James Renwick Alliance of the Renwick Museum. Served on the Honorary Board of Trustees for DC chapter of Design Industries Foundation for AIDS (DIFFA).